In osteoarthritis, wear of the cartilage is not the only problem. Sooner or later, inflammations in the joints will also start to play a role. It’s not for nothing that this condition is called “osteoarthritis” in English. And ‘arthritis’ means nothing more and nothing less than ‘inflamed joints’. Osteoarthritis is therefore not only a mechanical wear of the cartilage, but also an inflammatory disease. How does inflammation occur in osteoarthritis joints? Arthrosis causes the cartilage to crumble between the joints. The inflammations are the direct result of this damage. In response to the loose cartilage fragments, arachidonic acid is released from the cell membranes. The enzyme COX-2 then converts this arachidonic acid into prostaglandins which cause inflammation of the joints. If only the cartilage is affected, you will not feel like it. In cartilage there are no nerves present. However, the inflammation may extend to the joint fluid, and then to the surrounding mucous membrane and bone. Then you can feel pain because nerves are present in the mucous membrane and bone. However, these register pain because of a high concentration of inflammatory factors in the joint fluid. In the initial phase – if the pain is still bearable – Paracetamol can provide a solution. But if the pain continues to increase, the doctor will prescribe an anti-inflammatory analgesic. Usually it will be Ibuprofen or Diclofenac. How does inflammation start in osteoarthritic joints? In osteoarthritis, the cartilage between the joints degenerates. The inflammations are the direct result of this damage. In response to the loose cartilage fragments, arachidonic acid is released from the cell membranes. The enzyme COX-2 then converts this arachidonic acid into prostaglandins which cause inflammation of the joints. If only the cartilage is affected, you will not feel like it. In cartilage there are no nerves present. However, the inflammation may extend to the joint fluid, and then to the surrounding mucous membrane and bone. Then you can feel pain because nerves are present in the mucous membrane and bone. These, however, take pain because of a high concentration of inflammatory factors in the joint fluid. In the initial phase – if the pain is still bearable – Paracetamol can provide a solution. But if the pain continues to increase, the doctor will prescribe an anti-inflammatory analgesic. Usually it will be Ibuprofen or Diclofenac. Ibuprofen and Diclofenac belong to the group of the NSAIDs, meaning Non-Steroidal Anti-Inflammatory Drugs. These drugs have a double effect. They reduce the pain and inhibit inflammation in the joints. The mechanism of action of Ibuprofen and Diclofenac relies on the inhibition of COX-2 enzyme activity. Therefore, the conversion of arachidonic acid to inflammatory prostaglandins is largely blocked. Both anti-inflammatory painkillers do this effectively. However, these drugs will have to be taken daily, because the duration of action is always short. Ibuprofen is a combination of the English iso-butyl-propanoic-phenolic acid. It was developed by the English pharmacist Boots and since 1969 it was registered as a medicine. Because the patent has now expired, it can now be produced by other manufacturers. 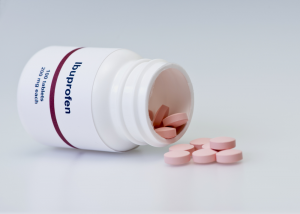 Therefore, Ibuprofen is now also available under the brand names Adulfen, Advil, Brufen, Buprophar, Dolofin, Epsilon, Ibuphar, Motrin, Nuprin, Nurofen, Optalidon, Sarixell, Spidifen and Zafen. In the supermarket there is a 200 mg strength for sale. For the double dose, you can only go to a drugstore or pharmacy. 600 mg and higher is available at the pharmacy only on doctor’s prescription. The name of Diclofenac is also derived from its chemical structure: dichloranilino phenylacetic acid. This drug has been on the market internationally since 1974. The active substance of Diclofenac is also present in anti-inflammatory analgesics Arthrotec, Cataflam, Diclofenac sodium, Diclon, Naclof, Voltaren and Voltarol. Diclofenac is the brandless variant. In strength up to 12.5 mg, Diclofenac is available without a prescription at a pharmacy and drugstore. A higher dose of 25 mg is available only at the pharmacy, but still without prescription. Higher doses are available only on doctor’s prescription. 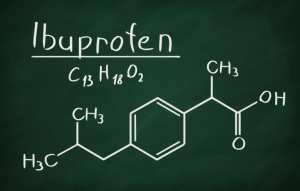 What are the side effects of Ibuprofen and Diclofenac? Ibuprofen and Diclofenac fight inflammation of the joints by inhibiting the action of the COX-2 enzyme. As a result, less arachidonic acid is converted into inflammatory prostaglandins. However, the disadvantage of these anti-inflammatory analgesics is that they also reduce the production of the enzyme COX-1. This enzyme is a “brother” of COX-2, but plays a major role in the protection of the gastrointestinal mucosa. Therefore, inflammation of the gastrointestinal tract can be ignored when COX-1 is inhibited. In addition, the use of these NSAIDs may cause vomiting, heart burn, bloody stool, nausea and stomach ulcer. When using Ibuprofen, the following side effects may also occur: headache, twisting, fatigue, tightness, rash and itching. The list of side effects with Diclofenac is even larger. This can be expanded with, among other things, hepatitis, depression, impaired renal function and ovarian cancer. 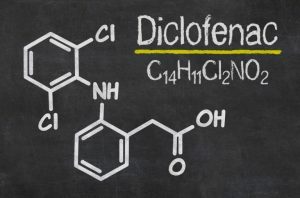 The regular use of Diclofenac would increase the risk of heart disease and heart attack by as much as 30 to 40 percent. Therefore, this medicine may no longer be used by patients with cardiovascular disease since 2013. Every year, thousands of people are hospitalized by irresponsible use of these anti-inflammatory painkillers. Therefore, always choose the most suitable remedy with your doctor. In addition, the advice is to use Ibuprofen and Diclofenac only for a short period of time, and not to buy this easily without a doctor’s prescription at a supermarket, drugstore or pharmacy. 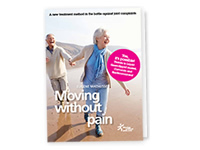 Living with pain or choose a natural alternative? Ibuprofen and Diclofenac are therefore effective anti-inflammatory analgesics that have a more or less immediate effect. However, the advice is not to use them for too long. In addition, these drugs can cause nasty side effects. Therefore, many people with osteoarthritis and other joint complaints have the feeling that they are not getting any further. What is the alternative if you have used these anti-inflammatory painkillers for a while or if you get sick of these drugs? Stopping means that the inflammations blaze and that you should live with pain in the joints. Optionally, surgery of the affected joint could also provide a solution (for example, read more about the knee prosthesis or hip prosthesis). 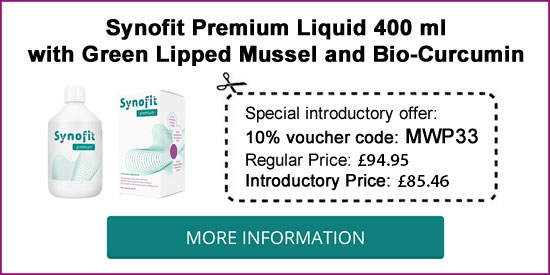 Meanwhile, many people benefit from liquid Green-lipped mussel with Bio-Curcumin and Blackcurrant leaf. This is a natural anti-inflammatory supplement that can positively affect the joints. It can be used safely – even in combination with almost all other drugs – and no side effects are known to date. This means, in contrast to Ibuprofen and Diclofenac, that it does not affect COX-1. Therefore, the protective function for the gastrointestinal tract of this enzyme is completely intact. The Green-lipped mussel is very rich in Omega-3 fatty acids. In addition to EPA and DHA, this new-born mollusk contains a whole range of other Omega-3 fatty acids, including some very rare ones. The structure of these fatty acids closely resembles that of arachidonic acid. In a wide range of Omega-3 fatty acids in the joints COX-2 will convert less arachidonic acid into inflammatory prostaglandins. Instead, this enzyme converts Omega-3 fatty acids in metabolites that will inhibit the inflammation. Curcumin inhibits the formation of arachidonic acid in the joint’s mucous membranes. This leads to a reduction in inflammation. In addition, it inhibits the production of COX-2, causing fewer inflammatory factors to be formed. Finally, Curcumin reduces the production of proteases that break down the cartilage (called MMPs). Blackcurrant leaf promotes the secretion of uric acid. This prevents uric acid from precipitating into the joints in the form of crystals. It also promotes the production of anti-inflammatory hormones in the adrenal gland (“body-like prednisone”). Liquid Green-lipped mussel with Bio-Curcumin (BCM-95®) and Blackcurrant leaf is therefore an effective anti-inflammatory inhibitor. This natural remedy reduces the pain and swelling and improves the mobility of the joints. In 70% of users, this fluid joint cure has a good effect within 3 months. Good to keep in mind when you want or need to stop with Ibuprofen and Diclofenac.